Out of his grief and desperation, he was moved to go to Pilate and beg for the body of Jesus. When he arrived, Pilate was unsure if Jesus was even dead yet. 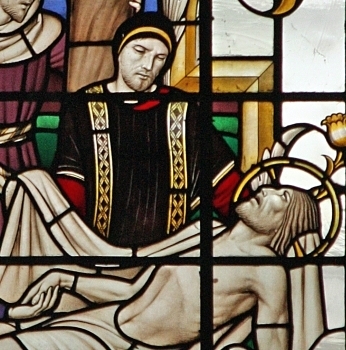 The centurion informed Pilate that Jesus had died and Pilate, with body to Joseph. He ran and bought fine linen and went to bury the body of Jesus in his own tomb. On his way, he metNicodemus who brought spices to take part in the burial. It would seem that the death of Jesus had moved both of these two men with much to lose to take a frightening step and demonstrate their allegiance to this now-dead crucified man.It was Jesus' death that finally brought these two men into the Kingdom.